How do I find what I need in the LRC? Search the catalogue either from the LRC website or on one of the OPACs set up in the LRC. Feel free to ask LRC staff at any time for assistance. The LRC is clearly signed and you will find resources arranged in the following areas: Fiction, Biographies, Graphic Novels, Newspapers & Magazines, Non-Fiction, Reference, VCE resources (red sticker on the spine), Stacks, CDs & DVDs. Student identification cards must be presented when borrowing. Come to the circulation desk with your resources and LRC staff will scan them out and stamp with due dates. How many books can I borrow, and for how long? Fiction and non-Fiction books, magazines and CDs are available for 2 week loans. 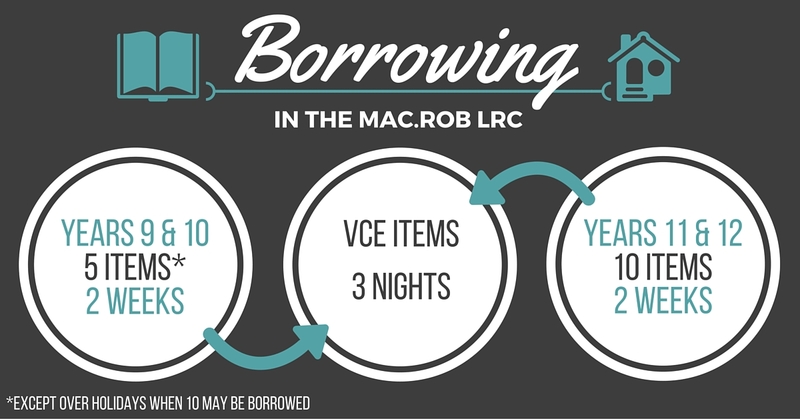 Items in The VCE collection are available for 3 night loans. If a book is lost or damaged while out in your name, it is expected it will be paid for. 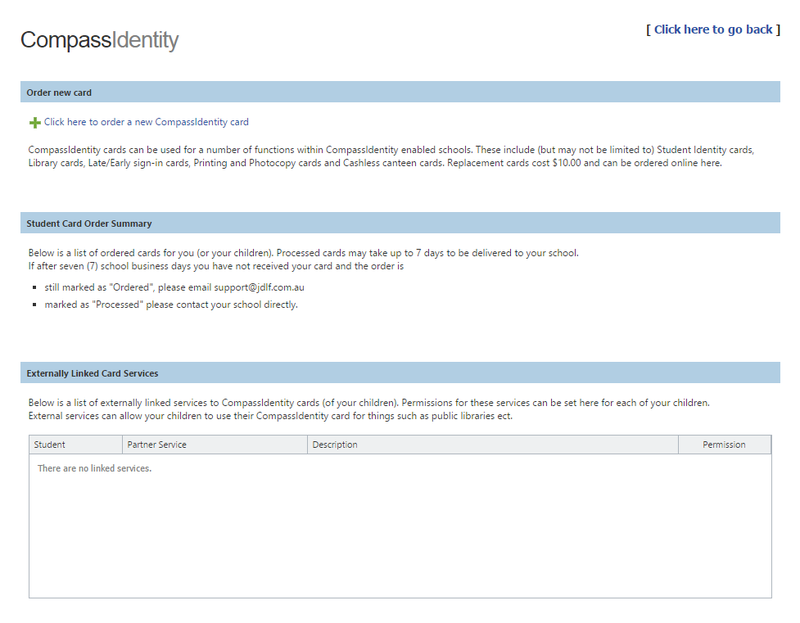 VCE books cannot be renewed, nor can books that have been reserved by someone else or are more than a week overdue. Renew books at the circulation desk. Students are not allowed to borrow when they have overdue books. Overdue notices are circulated every week via your school email. Students who fail to return VCE resources by the due date will, on their 3rd recorded overdue date, have their borrowing privileges on VCE resources suspended for a term. Why have I been banned from VCE borrowing? 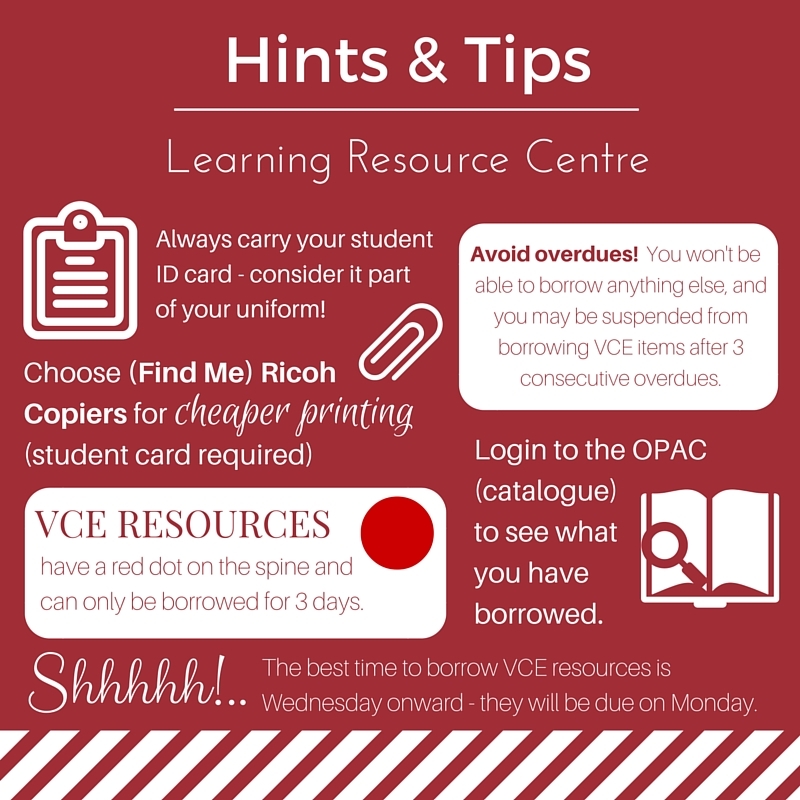 The LRC's policy with VCE/3 night loan items is that if they are returned late 3 times, or are 3 times overdue, the borrower will be suspended from borrowing VCE items for the rest of the term. Regular reminder emails are sent to students with overdues. VCE bans are cleared at the end of each term. Why have I been banned from borrowing AV equipment? AV equipment (Laptops, laptop chargers, phone chargers and adapters) must be returned the same day it is borrowed. If AV equipment is kept out overnight the borrower may be suspended from borrowing AV equipment for the rest of the term. What if the book I want is not available? You can reserve a book by logging into the OPAC (catalogue) and dragging the book you want to the ‘Reserves’ tab. Alternatively come see LRC staff at the circulation desk. If the LRC doesn’t have a book please feel free to visit the LRC website and use the ‘Request a book’ function. You will be emailed when the book you’ve requested/reserved is ready for collection. How do I book the Student Conference Room / AV Lounge? These spaces are available for students to borrow from the circulation desk with their student cards on a first come, first served basis. Occasionally teachers may book these spaces for students. Can I access resources from home? The LRC databases can be accessed from home through the LRC website, providing you with instant access to thousands of full-text, scholarly articles, encyclopaedia entries, study resources, video clips and back issues of newspapers, etc. What else does the LRC have available for borrowing? Aside from a very wide range of books, magazines & newspapers, the LRC provides laptops, chargers, adapters, headphones, board games, CDs and DVDs, whiteboard markers, and picnic rugs. What kind of AV equipment is available for borrowing? Can I take AV equipment home overnight? This equipment is available for use within the school only. Overnight borrowing may be arranged, please speak to one of the librarians if you require this. Student AV Guides and overnight borrowing forms can be found on the student portal here. What is the difference between the printers and photocopiers in the LRC? There is 1 printer in the LRC. L1 LRC Mono (Black & White printing): 11c per A4 page. There are 2 photocopiers in the LRC (you can also print from these, you sign in either using your ID card or your computer log in). Find Me Mono (Black & White printing/photocopying): 5c per A4 page. Find Me Colour (Colour printing/photocopying): 20c per A4 page. Save copier credit by printing your pages double-sided/on both sides. Thanks to an initiative by the Mac.Rob Enviro Group there is a 1c discount per page if printed double-sided. Help the environment and see your printing credit go further! Do I need my student card to print and copy? No. 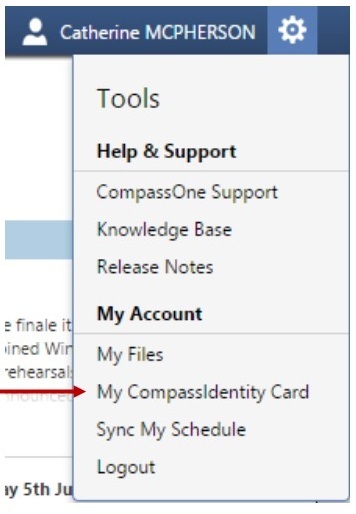 You can enter your Compass login into the photocopiers to release the print job or copy. How do I put printer credit on my student card? This can be done using any Compass kiosk around the school. Scanning to your USB or email is free. Can I bind my booklet or laminate pages in the LRC? Binding, Laminating and Blank CD/DVD purchase must be made at the General Office. Please hand your receipts to LRC staff and collect required materials. How can I order a new ID card? Replacement cards cost $10 and take about 10 business days to arrive. Once you have ordered your replacement care and can prove the order to LRC staff you will be permitted to borrow again.